1. Preheat the oven to 200°C, gas mark 6. Heat ½ tbsp oil in a pan, add the onion and cook gently for 8-10 minutes, until softened. Add the garlic and cook for 1 minute more. Add the chopped tomatoes and 450ml hot water; season. Bring to the boil; stir in the rice. Simmer gently, with the lid ajar, for 40-45 minutes, until the rice is tender. 2. Meanwhile, toss the aubergine with the remaining 1½ tbsp oil. Season and roast on a baking tray for 10-15 minutes, until golden. 3. 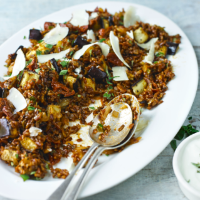 Stir the aubergine, sundried tomatoes and most of the oregano into the rice; season. Serve with the yogurt, cheese and remaining oregano. This nutty rice mix is a good source of fibre and protein. It makes a robust base for hearty rice salads. Traditionally used to aid digestion, this fragrant herb adds savoury, aromatic notes to garlicky, tomato-based dishes.